A LATE fiery spell from Australian fast bowler Pat Cummins has kept the chances of all three results well and truly alive heading into day four. India may hold a lead of 346, but the momentum is well and truly with the Australians. Here are five things we learned from day three. 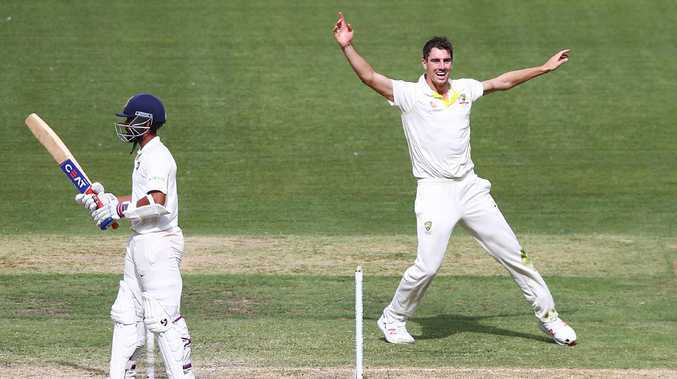 JUST when the Test match between Australia and India was dead, it was Cummins who gave the Aussies momentum heading into day four. Cummins covered 38.3km across the opening two days and has been out in the middle for all but 50 overs of the game. And when Australia needed a hero, Cummins stepped up with a damaging spell of 4-2 and was just metres off y claiming a hat-trick. He removed Vihari with a damaging short ball, before Marcus Harris claimed two beautiful catches at leg gully to dismiss Pujara and Kohli for ducks. He then undid Rahane, who was caught down down the legside by keeper Tim Paine. Cummins was Australia's hero in India's first innings, claiming 3-72 from his 34 overs - the most of any of the Aussie quick bowlers. He also occupied the crease well before being undone by Mohammad Shami. AUSTRALIA has just one innings left to improve its dire record with the bat in 2018, a year in which it has lost wickets at an average of 26.03 runs apiece. By that metric, the last time the batting was this fragile was in 1978. In that year, Australia lost six of its 10 Tests - a record the current crop look set to match - and lost wickets at an average of 25.35. The fragility of the current line-up was brutally exposed on day three of the Boxing Day Test, as the MCG pitch went from interstate highway to country road. 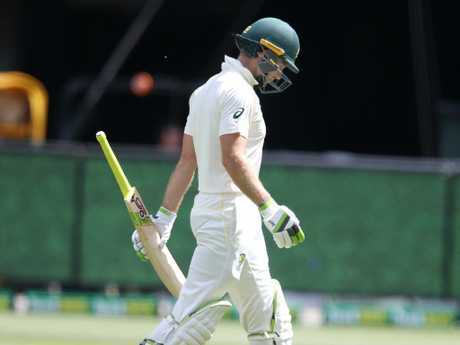 After India ground its way to 7-443 across the first two days of play, Australia was skittled for 151 in 66.5 overs - the 10th lowest score and 15th shortest innings by Australia in a first dig at the MCG. As India's bowlers put on one of the most complete performances by an attack this year, Australia's batsmen fell for every trap the tourists set. Aaron Finch clipped Ishant Sharma straight into the hands of short midwicket only two overs after Virat Kohli had put the fielder there for that very shot. Marcus Harris was caught hooking Jasprit Bumrah, having struggled against the quick's bouncers all series. Playing with hard hands, Usman Khawaja was caught off Ravindra Jadeja's left-arm finger-spin, before Bumrah produced the delivery of the day to remove Shaun Marsh - an ingeniously executed slower ball on the cusp of lunch. The skill of that particularly delivery was contrasted by the looseness of Travis Head's ill-advised drive against the same quick and the indecisive footwork that led to Mitch Marsh edging Jadeja to first slip. AS THE MCG pitch begun to deteriorate, not even India wanted to be caught in a situation where they had to bat last. Despite holding a 292-run lead, Virat Kohli wasn't tempted to enforce the follow-on for Australia, instead making their fast bowlers return to the field in the searing heat at the MCG. With the footmarks continuing to grow on the MCG pitch as well as the uneven bounce being more obvious, India's openers ran from the field and came out to bat 10 minutes later. Even the possibility of rain on day four and five didn't put Kohli off in making his decision, with the Bureau of Meteorology tipping up to 4mm. "I think they've just decided to take the weather out of consideration," Harsha Bhogle told Fox Cricket as Pujara came to the crease after the fall of the first wicket, with India not appearing to be chasing quick runs. But after Pat Cummins' hot spell of 4-2 ripping out the Indian top order, there's no doubt Australia gained some small momentum late on day three, despite starring down the barrel of a huge run chase. AUSTRALIA captain Tim Paine's attitude with the bat can't be questioned after the No.7 once again attempted to dig the home side out of a hole against India at the MCG. Tim Paine stood tall before his dismissal. While Paine is yet to score a Test match century from 31 innings, his gritty and solid approach has allowed him to dig deep and bat for long periods of time since being handed the captaincy. During the tour of the United Arab Emirates, Paine faced 194 balls to bat out a tense draw alongside Nathan Lyon, garnishing support from the Australian public. While on home soil against India, Paine has faced on average 76.6 balls per innings. The 34-year-old faced more balls than any other Australian batsman in the first innings, scoring 22 runs from 85 balls before becoming one of Jasprit Bumrah's second victims. Paine's batting record per dismissal is in a high class and depending on his second innings he could finish the calendar year having faced more than 91.5 balls per dismissal - a figure that only two other wicketkeeper-batsman this century (Kumar Sangakkara and Jonny Bairstow) have reached. JASPRIT Bumrah has just about been the best fast bowler in Australia for the past month and now he has the figures to show for it. Bumrah climbed to the top of the wicket-takers chart for the series on Friday, taking a six-wicket haul to take his campaign tally to 17 at an eye-watering average of 14.11. Bumrah bowled with plenty of venom but absolutely no luck in Perth, beating the outside edge repeatedly. At the MCG he got the reward he deserved, taking the third best figures by an Asian quick in Australia ever - his 6-33 behind only compatriot Kapil Dev's 8-106 in 1985 and Sarfraz Nawaz's 9-86 for Pakistan in 1979. Despite his unique bowling action - think a catapult in human form - Bumrah was described as "technically perfect" by Kerry O'Keeffe on Fox Cricket, and it's hard to argue he's wrong. Bumrah has it all, with his incredibly straight arm and wrist allowing him to swing it both ways and seam it off the pitch. He also has a rip-snorting bouncer and pinpoint yorker in his arsenal. He used every one of those weapons to dismantle Australia, bouncing out Harris, bowling Travis Head and Josh Hazlewood, finding Tim Paine's edge and trapping both Nathan Lyon and Shaun Marsh in front. He's got a brain on him too, with his dismissal of Marsh impressive for both its execution and the skill it required. With Marsh looking well set on 19 and having apparently weathered the early storm, Bumrah pulled out a slower ball yorker on the final delivery of the first session. It looked a full toss - it finished on Marsh's toe at just 111km/h - and the West Australian never saw it coming. Still only 25 years old, Bumrah has a bright future ahead of him.